The children fled the fire at Heysham in their nightwear. 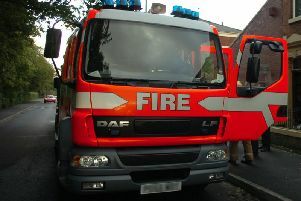 A mum-of-four has thanked the community for rallying round after her home was wrecked in a fire. A fundraiser will be held for Katie Ball and her family after their house on Warren Road, Heysham, was badly damaged in a blaze which started in a faulty tumble dryer. Katie and children Lucas (2), Sean (4), Tianna Rose (6), and Alisia (10) fled the house after the fire broke out last Tuesday night. The children’s dad Shaun discovered the fire as he went to lock up after the children went to bed. As he shouted at Katie and the kids to get out, he tried to pull the machine out of the house but the fire was already taking hold. Fire engines were called and extinguished the blaze. Katie’s mother-in-law Dawn Fleet set up a justgiving page to raise funds for the family who lost all their belongings. She wrote on the page: “My daughter-in-law is an amazing mum to four beautiful children. “We treasure children but tonight going to bed may have been another tragedy in the morning. I’m so glad it wasn’t. People offered items such as clothes and toys to help the family. Morecambe entertainer Stuart Michaels will also hold a fundraising event for the family at the Trimpell Club in Morecambe on Wednesday, August 16 from 5pm to 10pm. Live music will come from One Non Blonde, Body ‘n’ Soul, Jason Stardust, Dominic Clayton, Stuart Michaels and The Rest. Donations on the door. Hotpot provided by Kennedy’s butcher and bakers. Katie thanked Stuart for organising the event with a post on Facebook. “What a wonderful man putting all this together for me and my children and wonderful people for donating bouncy castles and the Trimpell (for donating) food, venue etc,” she wrote. Repair work will be carried out on the house and the family has a place to stay in the meantime.